The PM scored an honorary doctorate in Scotland last year. Prime Minister Justin Trudeau speaks to graduates during the convocation ceremony where he also received a honorary degree at the University of Edinburgh on July 5, 2017 in Edinburgh. Prime Minister Justin Trudeau is set to receive an honorary degree from New York University and deliver a commencement speech in Yankee Stadium this spring. NYU announced Monday that Trudeau will be given an honorary doctorate of laws at the school's 186th commencement on May 16. "As prime minister, Trudeau is focused on creating new jobs, fostering strength of out Canada's rich diversity, fighting climate change, and achieving reconciliation with Indigenous peoples," the university said in a media release. The school touted how, as a "proud feminist," Trudeau appointed Canada's first gender-balanced cabinet in 2015. 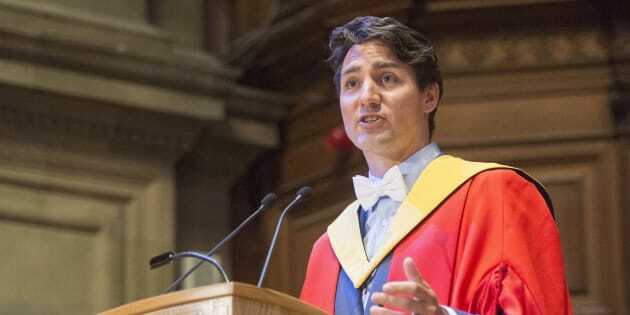 Trudeau also scored an honorary doctorate from the University of Edinburgh in Scotland last July. In an optimistic speech to graduates, the prime minister showed off a pretty decent Scottish accent. Trudeau's predecessor, Stephen Harper, received an honorary doctorate from Israel's University of Tel Aviv in 2014. The news comes as Trudeau's government tries to convince U.S. President Donald Trump not to walk away from the North American Free Trade Agreement. The federal government is also working to keep Canada exempt from U.S. trade tariffs on steel and aluminum. Trudeau and other ministers have made several trips to the U.S. in the last year to promote NAFTA and the Canada-U.S. economic relationship. In February, the prime minister visited Chicago, San Francisco and Los Angeles. Though sometimes framed in U.S. media as a kind of "anti-Trump," the prime minister is careful not to publicly criticize his counterpart. He recently complimented Trump as a man of his word during an interview with CNN's Anderson Cooper. However, the themes Trudeau frequently hits in big addresses — on embracing diversity and rejecting isolationism — inevitably yield comparisons to Trump. In a fawning cover story in Rolling Stone magazine last summer, Trudeau was even held up as the antithesis to Trump. The magazine asked: "Why can't he be our president?" Conservatives blasted the story a "serious misstep" that jeopardized NAFTA talks. Deputy Tory Leader Lisa Raitt argued at the time that Trudeau ought to have known the magazine would compare him favourably to the president. New York City is, of course, Trump's hometown.